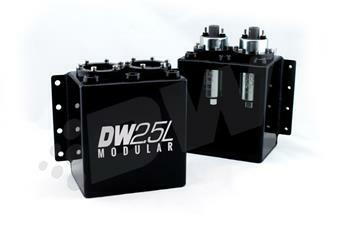 DeatschWerks Modular Fuel Surge Tanks are engineered for versatility. Available in 2.5 liter and 3.5 liter capacities, the 2.5L tank can hold single or dual DW250iL in-line fuel pumps, and the 3.5L tank can hold single or dual DW350iL in-line fuel pumps. The tanks can be mounted horizontally or vertically. Block-off plates are included to allow running ANY in-line pump externally.